Political Arithmetik: Did Clinton take a hit after the debate? Did Clinton take a hit after the debate? Since the October 30 Democratic debate, political conversation has focused on how much Sen. Clinton may have been damaged by her first "rough" debate performance. After uniformly positive evaluations of her handling of previous debates, especially in August and September, Clinton stumbled with answers that her rivals portrayed as waffling and inconsistent. This weekend two new New Hampshire polls appeared that lend credence to the notion that Clinton's standing has taken a dip, though whether due to the debate or not remains "debatable." The Boston Globe and University of New Hampshire found Clinton falling to 35% 11/2-7/07 from 41% in the CNN/WMUR/UNH poll of 9/17-24/07. Obama had a small rise, to 21% in the latest from 19% in the earlier poll. Meanwhile, the Marist College poll taken 11/2-6/07 put Clinton at 38%, compared to 43% in Marist's previous reading 10/4-9/07. Obama gained five points over those two polls, to 26% from 21%. Finally, a Rasmussen "robopoll" taken on 11/5/07 has Clinton at 34%, down from 40% in their 9/16/07 poll. Rasmussen also has Obama rising to 24% from 17%. So on the basis of these three polls, and "apples-to-apples" comparisons of polls done by the same polling organization, there is pretty good reason to think Clinton has dropped a few points in New Hampshire, and that Obama has gained a few. The Clinton average change in the three polls is -5.7 points, and Obama's gain is 4.7 points. If we turn to the trend estimates, based on all the polling rather than just the last three, we see a different but still interesting picture. The vertical black line in the charts marks the date of the debate. With just three new polls, the standard trend estimator will respond to the new polls, but won't "bend". The blue trend is deliberately conservative, and wants more evidence that the trend has actually turned down before it will change direction. However, the level of the estimated trend does respond to new data. For example, on Friday with Rasmussen included but not the Globe/UNH or Marist results, Clinton's trend estimate was 40.2%. With the new polls it is down to 39.3%. Likewise Obama was at 21.0% on Friday and is now at 21.7%. But the standard estimator may be too conservative. So we have a second estimator that picks up changes more quickly, though it can fall victim to noisy data and "see" a change when there isn't really one. So with some risk, it is fun to compare the more sensitive "red" estimator with the standard "blue" one. Red reveals two interesting details not visible in the blue trends. Clinton appears to have flattened out, at least, starting in late September. Obama had a noticeable dip in August-September, and since that time has been trending up for over a month. If we put a VERY sensitive estimate on the Clinton polls, we would even see a parabola shaped trend, one that rose sharply in September and early October, then fell equally sharply in November. This amounts to just connecting the polls, and ignoring all the noise and house effects present, something I am loath to do. But even being a bit cautious there is evidence that Clinton's good rise (about 5 points) in the third quarter has stopped and perhaps dipped a tiny bit in the fourth quarter so far. If more polls come in where the last three have, then even the blue standard estimator will flatten and turn down. Meanwhile the sensitive red estimator may be prone to chase the latest polls a bit too much. But it's suggested path for the dynamics of the race is neither as foolish as chasing each poll, nor as slow to notice change in trends as the standard estimator. "Red" may have something here. The story for Obama is also more hopeful in the red estimator. The few low polls in late August through late September suggested a slump down to the mid-to-upper-teens. The sensitive estimator catches this dip, but sees a steady rise since, to nearly 24% now. 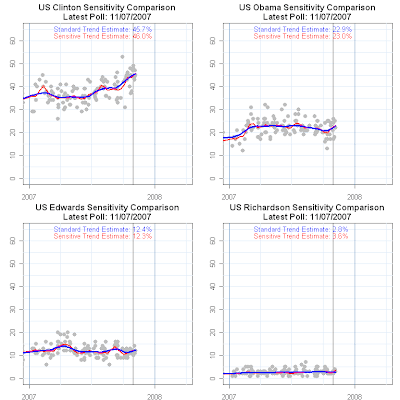 From the point of view of even the sensitive estimator, the changes affecting both Clinton and Obama pre-date the October 30 debate, though the estimate is influenced by the three post debate polls. The story "red" tells is that Clinton had a very good third quarter-- good news about her campaign, it's strength, and her good debate performances-- helped raise her New Hampshire standing by five points. Perhaps the same news, or reviews of his failure to make progress, helped sink Obama's support about 4 points during the same third quarter. But since October 1, these patters have changed, with Clinton seeing no further gains and Obama returning to the mid-20s. Before reaching too strong a conclusion, let's check some other data, and see if we can find any evidence for similar changes in trend in other data. In Iowa, where they watch the candidates at least as closely as in New Hampshire, there is no evidence of a flattening of the Clinton trend. If anything, the red trend estimate is slightly higher than is the standard blue estimate (30.5% vs 29.9%). Clinton has climbed steadily since the start of the third quarter and both red and blue estimates put that trend at almost the same rate. 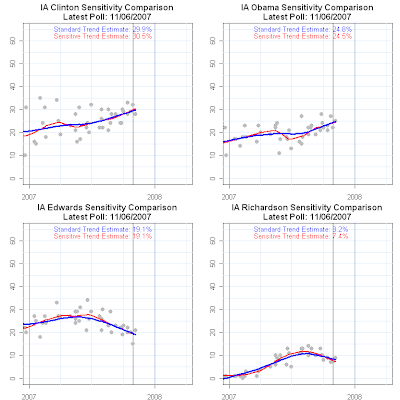 Obama has also seen gains since the start of the third quarter in Iowa, though the red estimate thinks the gains started from a bit lower level. At present the two trends agee quite closely, 24.8% for blue and 24.5% for red. If we look at the national picture, we see a substantial Clinton rise in the third quarter (with a plateau midway, followed by a surge) and a mild decline for Obama, reversed only at the start of the fourth quarter. The sensitive estimator matches the standard trend pretty well, certainly leading to the same conclusions. As my partner at Pollster.com, Mark Blumenthal, pointed out in an important post last week, New Hampshire and Iowa are not typical of the nation as a whole and are being exposed to vastly greater advertising and campaign appeals. Citizens there are also paying more attention to the race, given both advertising and their prized "first in the nation" status. So if we are going to detect changes in the fortunes of candidates, these two states are the best places to look. And when we do, we see some evidence of change but only in New Hampshire. 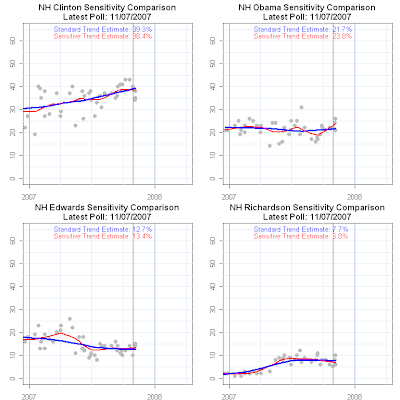 As always, more data can lead to a reconsideration, but at this point I think the evidence favors a view that Clinton's problems in New Hampshire may be more specific to that state rather than reflecting a more widespread change in her campaign's fortunes. New polling for Iowa could change that. At the moment we only have one post-debate poll from Iowa so the trends there are almost entirely driven by earlier data. But the 5 post-debate national polls are included in the national estimate with no effect, so that is some evidence that any impact is still to develop. Sen. Clinton may have given her opponents an opening in the last debate. It remains up to them to exploit that opening to their advantage, and up to the Clinton campaign to deflect such critiques. At the moment the New Hampshire polls suggest some changes in that state. But not yet elsewhere. Iraq Opinion: How Well is the War Going?